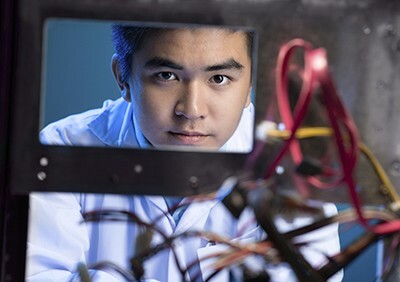 The Bachelor of Science in Engineering Technology program at Embry-Riddle leaves its graduates with deeper problem-solving skills, design skills, and engineering judgment as well as fundamental industry knowledge and research experience. Program faculty members have extensive backgrounds in engineering, technology, and related disciplines, and even non-technical core courses are taught by subject matter experts in their corresponding disciplines. Early on in the program, students take an Introduction to Research course that immerses them in hands-on research. Throughout the duration of the program, students learn about the purposes of research, how to define problems, how to design appropriate methodologies, and how to evaluate outcomes. All of this prepares the graduate for conducting applied research in the real world. With more than 130 locations globally and flexible classes offered online at your convenience, ERAU’s Worldwide Campus is especially suited for working students, those on the go, or students who want to save a bit of money while still living at home. Because you can select from a long list of specializations that align with specific career goals, graduates can be assured that the curriculum is applicable to their future careers. Offered entirely online through Embry-Riddle Aeronautical University Worldwide, this convenient and flexible degree program will prepare students to put their engineering skills to work in a variety of industries. Research projects, virtual labs and a capstone course round out the curriculum, ensuring that students graduate with the fundamental skills they need to achieve their career aspirations. Offered entirely online through ERAU’s Worldwide & Online Campus, the B.S. in Engineering Technology degree program prepares students to put their engineering skills to work in a variety of industries. This convenient, flexible degree program gives students the opportunity to partake in research projects, virtual labs, and a capstone course, ensuring that students graduate with the fundamental skills they need to achieve their career aspirations. With more than 130 locations globally and flexible, convenient classes offered online, ERAU’s Worldwide & Online Campus is especially suited for working students, those on the go, or students who want to save a bit of money while still living at home. When students study at the Worldwide & Online Campus, they become a member of the ERAU community complete with its many networking opportunities. Demonstrate technical skills as practicing technologist through applying knowledge and discipline specific tools. Operate effectively in a diverse, collaborative environment demonstrating their professionalism, teamwork, and communication skills. Demonstrate self-directed lifelong learning and the ability to undertake graduate study related to technology. With the rapid advancement of science and technology in today’s world, every industry needs highly qualified engineers who can keep innovation moving forward. Offered entirely online through Embry-Riddle Aeronautical University Worldwide, this specialized degree program will prepare you to put your engineering skills to work in a variety of industries. Through the use of cutting-edge virtual labs and simulation methods, students will develop the skills to design, refine and apply engineering technologies across a range of industries. You can also choose to target your studies with a particular concentration including Aeronautical Science, Aviation Safety, Helicopter Operations and Safety, Logistics Management, Management Information Systems, Occupational Safety and Health, Project Management, Security and Intelligence, Transportation and Unmanned Aerial Systems. Current Worldwide students requesting a change of program to the BS in Engineering Technology degree program must complete the English and Math Skills Assessments and place into ENGL 123 and MATH 241; OR demonstrate transfer credit reflecting academic preparedness for immediate entry into ENGL 123 and MATH 241; OR successfully complete Embry-Riddle prerequisite coursework for immediate entry into ENGL 123 (ENGL 106) and MATH 241 (MATH 142 or 143). The Engineering Technology Area of Concentration is the degree area where credit for prior engineering technology learning is housed or where students can take courses to learn about engineering technology. Many students bring in all or part of this credit based on prior engineering or engineering technology training or experience. However, shortages in the minimum credit required can be made up by taking courses in the following related disciplines: Aeronautical Science, Aviation Safety, Helicopter Operations and Safety, Unmanned Aerial Systems, Transportation, Logistics Management, Management Information Systems, Occupational Safety and Health, Project Management, Security and Intelligence. Prior-learning credit established by the University for certain engineering and aviation licenses and ratings as they relate to this degree. Many Embry-Riddle courses are designed to teach the same skills and knowledge that engineering technology students have acquired through experience and training. Students who complete courses in the same engineering specialty for which they were granted credit would be duplicating coverage of the same subject matter. Credit for completion of such courses will not be applied to degree requirements. Following concentration areas are available to BSET students. Students may choose at least 3 courses each from two concentration areas. With industries like energy and robotics growing at a feverish pace, it’s no wonder the engineering field is hotter than ever.